Embrace Trade Show Display is 8ft full height (3 Quad x 3 Quad) is a sleek, collapsible, portable tabletop display that delivers style with minimal effort. Embrace 8ft full height (3 Quad x 3 Quad) features a sleek, collapsible anodized silver frame with channel bars that hold push-fit fabric graphics offered with or without endcaps. No tools are required for assembly. The lightweight and highly portable display packs away as easily as it sets up for the ideal trade show, event or retail display! Graphic Width: With no end caps: 92.25", With end caps: 119.25"
Graphic Height: With no end caps: 92.25", With end caps: 92.25"
Embrace 2.5ft Full Height Push-Fit Tension Fabric DisplayEmbrace™ 2.5ft full height (1 Quad x 3 Quad.. Embrace 5ft Square Tabletop Push-Fit Tension Fabric Display Embrace™5ft square (2 Quad x 2 Quad) is.. Embrace 8ft Tabletop Push-Fit Tension Fabric DisplayEmbrace™ 8ft (3 Quad x 2 Quad) is a sleek, colla.. Embrace 10ft wide Trade Show Booth Holds Push-Fit Fabric GraphicsEmbrace™ 10ft full height (4 Quad x.. Embrace 20ft wide x 7.5ft Tall Push-fit Stretch Fabric DisplayThis extra wide display runs 20 feet l.. 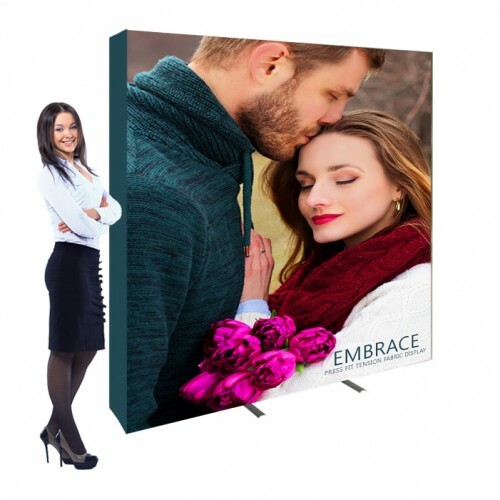 Embrace 11ft x 7.5ft L-shape Left Corner Push-Fit Tension Fabric Display This 11ft wide Embrace™ bo..